The EJS Roller Coaster model explores the relationship between kinetic, potential, and total energy as a cart travels along a roller coaster. Students can choose from five track configurations or create their own roller coaster curve and observe the resulting motion. As the simulation plays, energy bar graphs show the changing levels of kinetic and potential energy. Switch to "stepped motion" to see points at which both forms of energy reach maximum and minimum levels. Users can also control the initial speed of the cart and add friction, enabling the resource to be adaptable to a range of levels from middle school through high school. 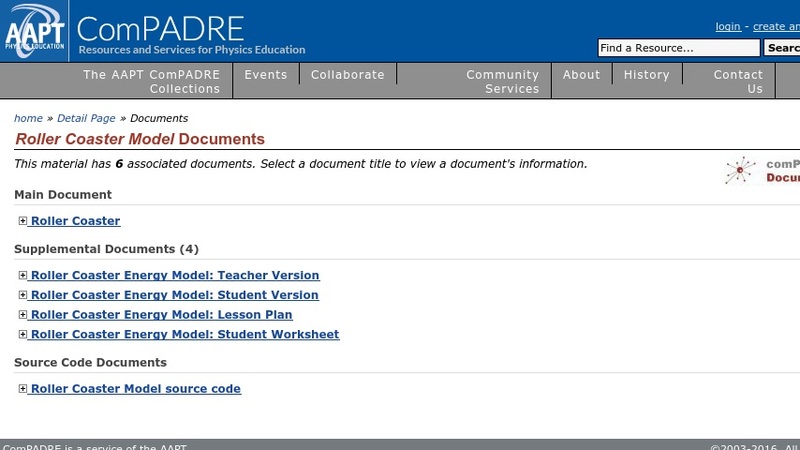 Editor's Note: Don't miss the lesson plan with accompanying student guide in "Supplementary Documents". See Annotations for additional background information on the physics of roller coasters, recommended by The Physics Front editors. This item was created with Easy Java Simulations (EJS), a modeling tool that allows users without formal programming experience to generate computer models and simulations. Use square root and cube root symbols to represent solutions to equations of the form x² = p and x³ = p, where p is a positive rational number. Evaluate square roots of small perfect squares and cube roots of small perfect cubes. Know that ?2 is irrational.